This holiest of weeks I would like to share a poem or piece of art each day, hopefully drawing you deeper into the Great Mystery we are celebrating. I begin with one by Malcolm Guite. Very often I have thought that I knew what Jesus was about, what he was doing and why he was doing it. Then later I realise it was more than that, something deeper, and my understanding is stretched, and later is stretched again. So it is with Palm Sunday. Jesus is always with me on on my journey but he is always behind me and he is always beyond me. 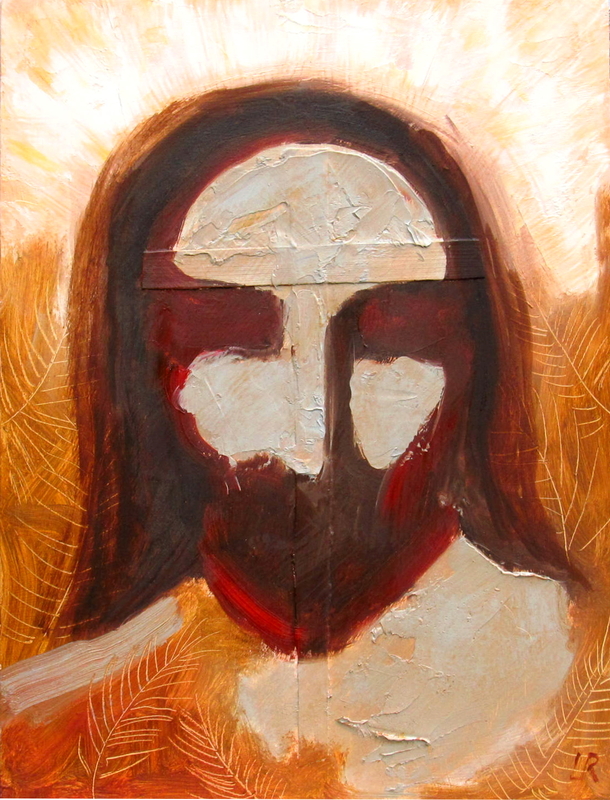 In this painting Jesus face is elusive, and the features are gestural brush strokes, but energetic and visceral. It is a mixed media painting and within the face is the palm branch that I received at the Palm Sunday service last year. In the painting there is a ceremony from the past, a reminder of the cross that is to come, but if we don’t give our attention, we might miss the present day revelation of Palm Sunday. What will Jesus say to us today? We might imagine there is nothing new to learn, but as our “easy feelings” go through the familiarity of a Palm Sunday service are we still listening?